Around the world, 6 out of 10 girls experience violence in their lifetime. In Togo, violence and harassment of a sexual nature, as well as early pregnancy in schools, are all obstacles to girls' schooling. The trivialization of this violence during adolescence perpetuates it in adulthood, reproducing an endless cycle. "Voices Against Violence" in Togo is an $85,000 USD project that was funded and implemented by the United Nations Volunteers (UNV) programme between October 2016 and April 2017. The project is based on an informal education program developed by the World Association of Girl Guides and Girl Scouts and UN Women. It aims to fight against gender-based violence by raising the awareness of young secondary students about the root causes of violence, ways to prevent it, and finding solutions. The training provides interactive, youth-centered ways for youth to talk about relationships and gender equity in a safe environment. It demands girls’ rights to live a life free from violence and fear. Believing in volunteerism and youth as an essential tool for social transformation, the project in Togo consisted of training 500 national volunteer teachers. The goal of this project was for them to adopt a healthy and non-violent behavior and, in turn, to deliver the program in their classes and in their communities. Eleven three-day training sessions were delivered by the Girl Guides Association of Togo with the support of Peace Corps volunteers in each region of the country. 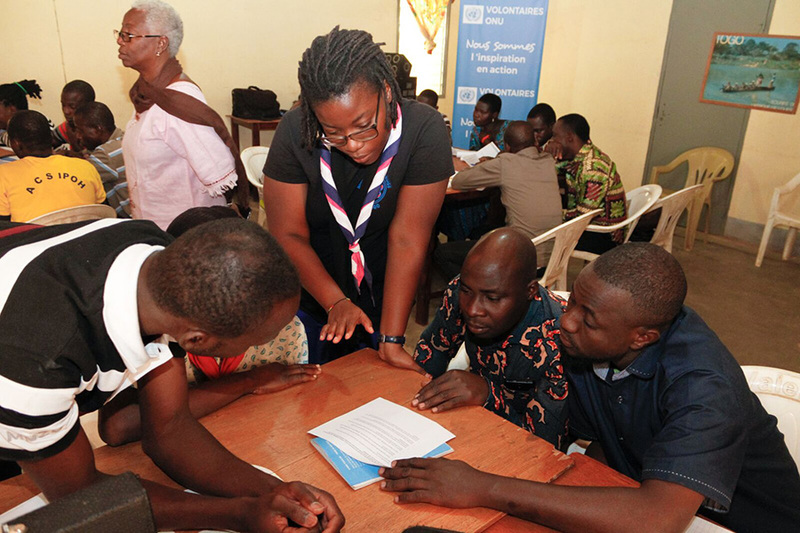 A total of 500 volunteer teachers and 50 Girl Guides and Girl Scouts were trained in the use of the program, covering 265 Togolese secondary schools. The teachers then trained an average of 100 students each, increasing the number of young people who received training at the national level to more than 50,000. The trained volunteers also brought awareness to 5,000 additional teachers as well as their families and communities, spreading the curriculum to thousands of young Togolese and to entire communities. 99% of teachers found the training useful and said it provided them with techniques to solve the problems they face in their communities. The study of opinion questionnaires also shows a significant shift in perceptions of gender roles and the causes of violence against women after the training, as much for teachers as for students. The monitoring of 240 trained teachers allowed us to note that 240 cases of violence were uncovered following the training, testifying to a freedom of speech and condemnations from the informed students.